Readers know that typical weekly content usually consists of two things: awesome blitzes and blown coverage/blocking/reads. Well, in a game that Michigan wins 44-13 and one in which Michigan spent most of the game in its base 4-3 set, there's not so much of that. However, there were a few things that the defensive ends did in this game that either confused or built on some positive trends we've seen developing for a while now. First, the bad--or weird. Why are you lining up like that? In both instances, the defensive end that drops off into coverage is lined up at least a full yard behind the other offensive linemen. It has happened too frequently for this to be a random occurrence, but it seems like an obvious tell for opposing QBs/perceptive linemen. It's hard to argue with results, though. 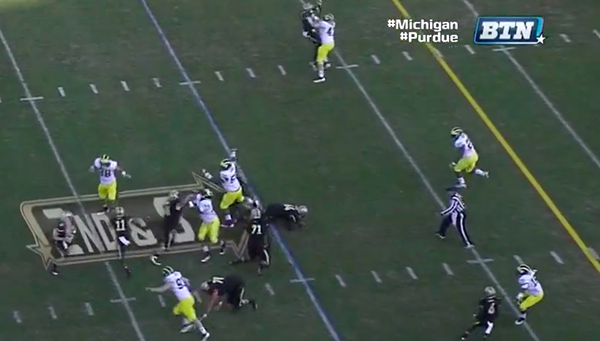 The only explanation I can see for this is that Mattison would rather the defensive ends be a step or two closer to their coverage zone and hint at the drop before the snap than be unable to get to the coverage zone. This makes sense when you think about Mattison's blitzes as well: most of the time they're designed to overwhelm one side of the offensive line and not as concerned with each offensive lineman be confused about his assignment. 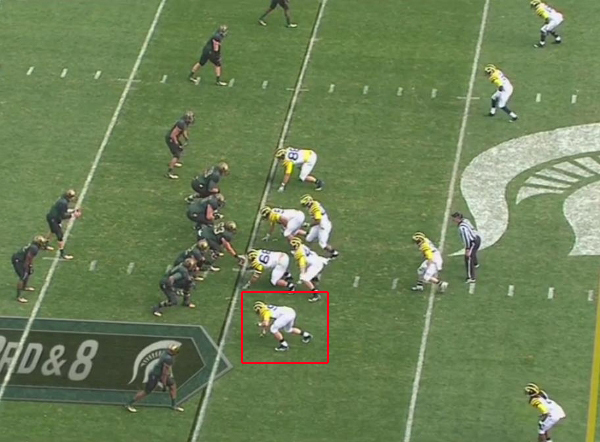 Regardless, if anyone can give me a better explanation for why Mattison is coaching the defensive ends to do this, it would be appreciated. This is especially pertinent after Monday Night Football this week in which JJ Watt proved on national television that he's one of the best defensive tackles in the league if only because he swats down countless passes at the line of scrimmage, but one of the things Michigan's defensive ends have been doing all season (and dating back to last year) is batting down passes. Most notably, Frank Clark had the PBU/interception in the Sugar Bowl last year, but it's a trend that has continued. In a lot of passing situations, it looks like Mattison has instructed the defensive ends to rush upfield and relatively far outside. The following play is not a great example of this, but it was the only instance of it I saw in the game. 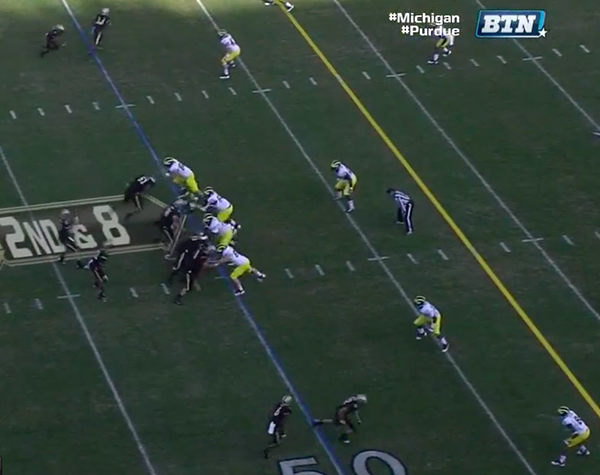 The lineman you'll be watching is Craig Roh (the defensive end on the top of the screen). 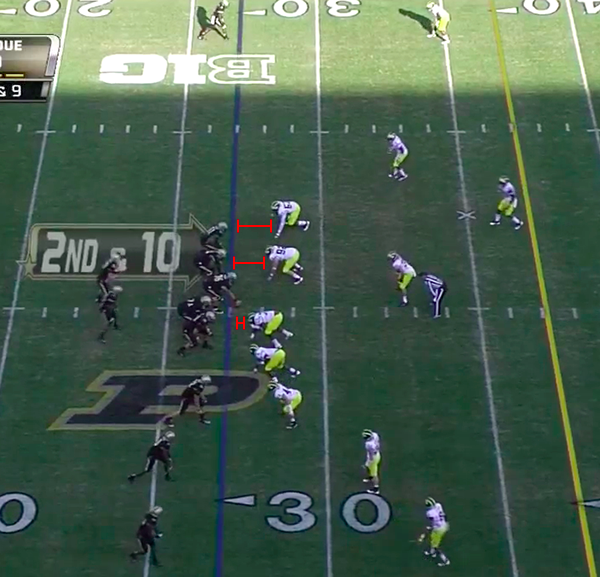 Roh is shaded pretty far inside the offensive tackle (I believe he's playing a 3- or 4-tech). Despite that alignment, when he begins his rush, he starts going outside. 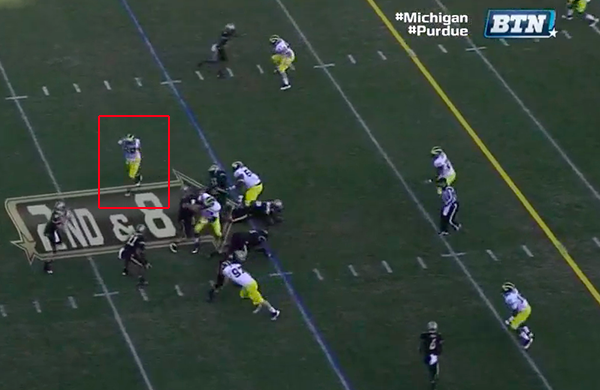 The reason this isn't a great example of this play is because the offensive tackle tries to cut block him. ... but instead of rushing directly at TerBush, Roh reads his eyes and forces him to come off his first read. 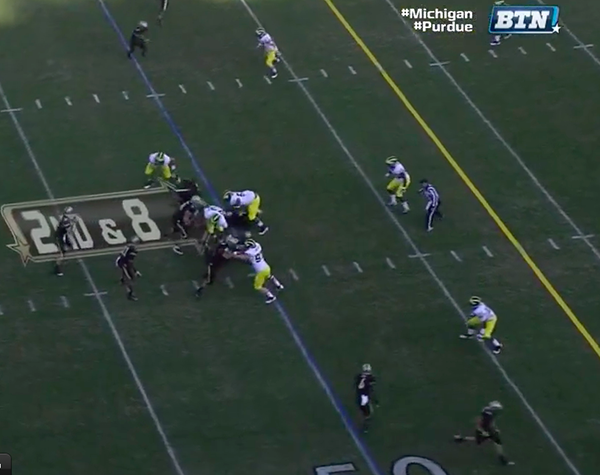 TerBush is forced to pull the ball down and the Purdue running back will recognize the pass rush and block Roh. 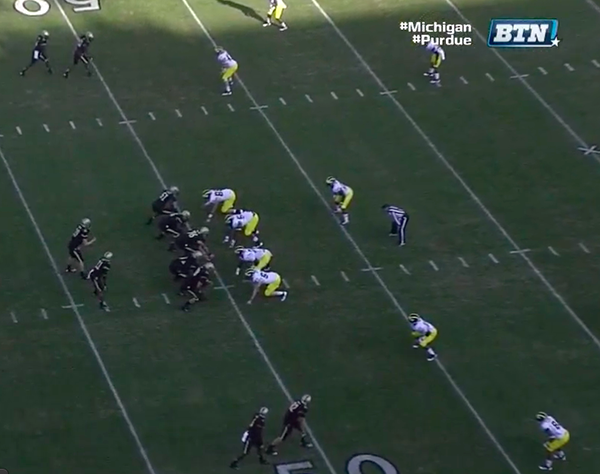 This play actually ends as a fairly long completion for Purdue after TerBush scrambles in the pocket for a while, but this illustrates what Michigan's defensive ends have been doing all season. Clark has been the most notable defensive end to go for these pass breakups, but with Roh doing it here, there's a good chance that this is something the coaches are instructing them to do. In addition, it takes a level of foresight to rush as widely as Roh does here and Clark does frequently for this to be a lucky occurrence.